Precision, quality, power: a bass that rocks! NS-2J, 4-string bass guitar from Spector. I bought this bass without even knowing what a Spector is... Pure chance, among a series of used bass guitars. 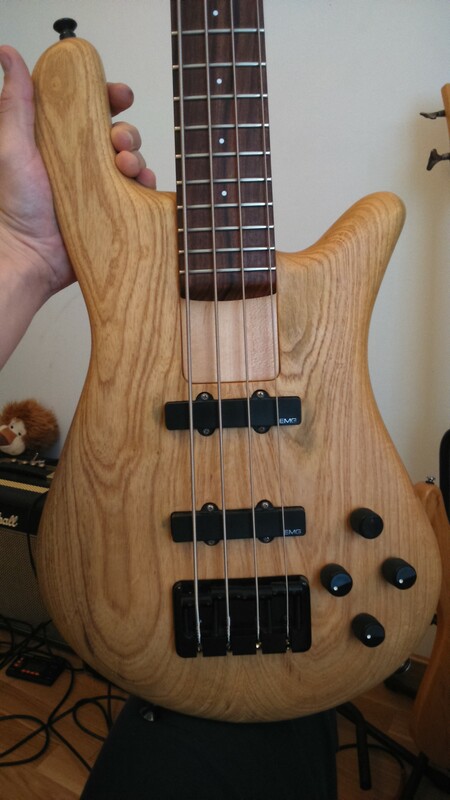 Not even the seller seemed to know what it was, so I was lucky to get it for a third of its normal used price – let alone the fact it actually has the active tone setting option! 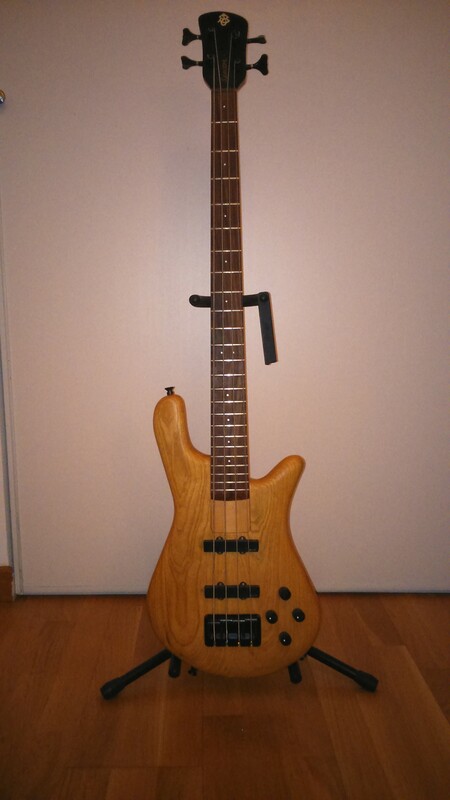 I’ve tried a bunch of basses, Warwicks to Fender to many Ibanez, Rickenbaker, Cort and many more. This is THE ONE which suited me. A real crush!! No wonder, this bas sis a beast !!! 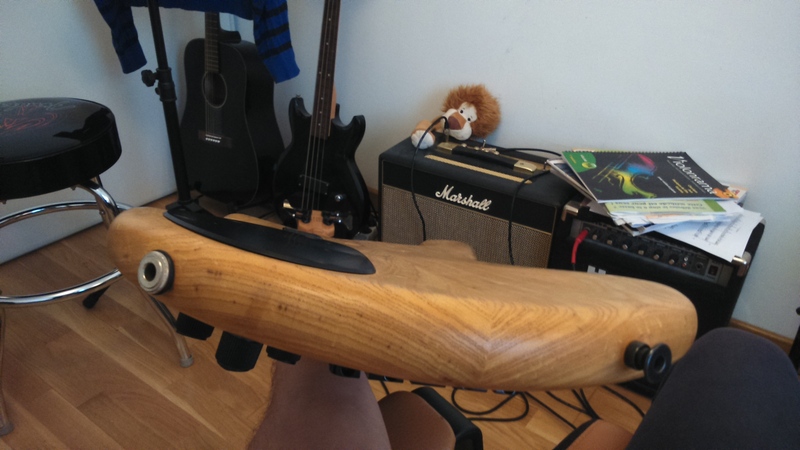 The neck is just perfect – round, thick but not too much, regular, slightly lacqueredto make it slide without leaving sweat marks… And there’s ground for sweating, this bass will allow just everything – absolutely everything. Impressive! Both the covered EMG jazz pickups are awesome with their warm and powerful sounds, while retaining incredible subtlety and sound color. Nothing seems to get lost with them! All for a very clear and powerful sound! The (optional) active tone control is also wonderful, upgrading the whole with a great clarity – and how great it is to work on your sound!! From a big, slappy sound clearer than anything for slap, to a low, heavy sound with maximal growl, plus clear-sounding arpeggios in the lower neck, so congrats to Aguilar for this OBP-3!! Lows and highs are provided with a very wide midrange, allowing to work on them as you please on the preamp or through amps/pedals. It’s a bass you have to live up to as it’s really full of punch. Don’t go after sounds that will gently bounce, and I really love Jazz Basses (both for their touch a	nd sound – a US-made American Standard Jazz Bass I mean, of course), but the Spector sounds “fuller”, more straight-to-the-point, harder sometimes but still precise. It provides a big sound, round and still less versatile and fat compared with an American Standard JB, it provides attack, low end, highs and lots of mids!!! Just what you need to put your groove, once you’ve tamed it soundwise. On a small combo (a 35W, neighbour-friendly model), it already shows its rich and diverse tones compared with other common basses, but when used with a 200/300W amp such as a Markbass… well, just HANG ON TO WHATEVER YOU CAN! I personally play in almost all styles, with a large preference for everything groovy – funk, disco but also rock, jazz and even classical and baroque, even a little pop, you know, you don’t always do what you like in a band (lol!). Its sound capacities are such that every style works. Quick and precise left hand play are more than possible, and the instrument’s sustain il quite interesting. The bass is a real lightweight, much lighter than, say, Ibanez’s SR1600. What I most like with it’s ergonomy is its curved body shape which perfectly fits your hip and/or belly, depending on everyone’s morphology. Perfectly wedged and light – in for a good time. The body is un-lacquered and very small, hence fragile and everything is likely to leave a stain on it, especially when slapping… Even well-cut nails will slowly leave traces. But hey, an instrument is supposed to be alive, ain’t it? No need to retune it except if you transport it with too little care – tuning won’t move, even when you play it daily. But its biggest asset is its fingerboard… Almost straight, barely curved, it’s wonderfully precise! You can play heavy or fat but also lightly and subtly, anything goes. 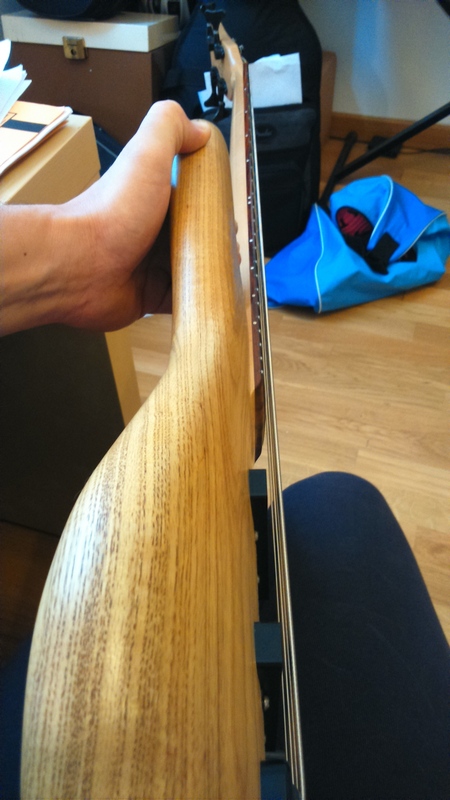 The neck’s width is perfectly suited to the fingerboard, with fingers finding naturally their place above the strings. By the way, the string-neck alignment excels everywhere even at the lowest setting, with incurved areas here and there where they’re needed. 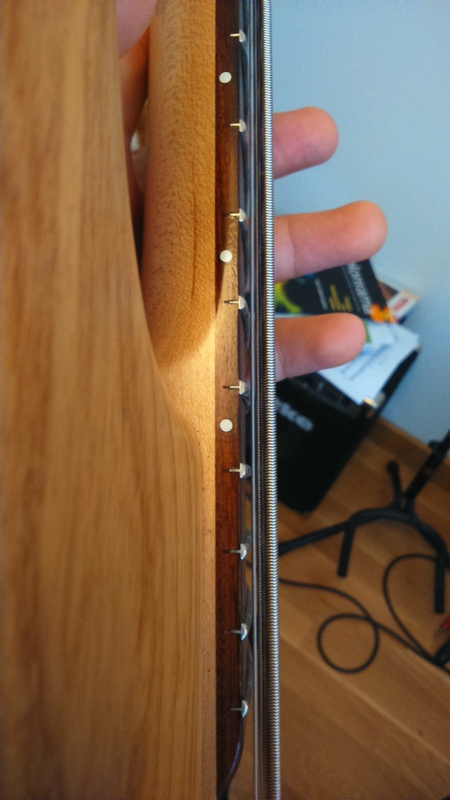 I’d say the E is 2 to 3mm away from the fingerboard with no fretbuzz. Welcome quickness – and precision too! The bridge is made of steel (or is it brass? ), it’s heavy and sturdy, it won’t ever move, vibrate, buzz or anything. The brass saddle is made of brass, and is sturdy too. The massive, closed-type tuners can be set to feel more or less “hard” and won’t move either if you don’t want them to. All this was made to last for a very, very long time! This bass is already 18 years old, and in perfect shape (yeah, agewise it’s reached its majority now, but I still won’t let it go out alone ). Of course, everything was hand-made and assembled. Each piece is unique. For the record, mine is a US model that came out from Stuart Spector’s famed shop in Woodstock, NYC. 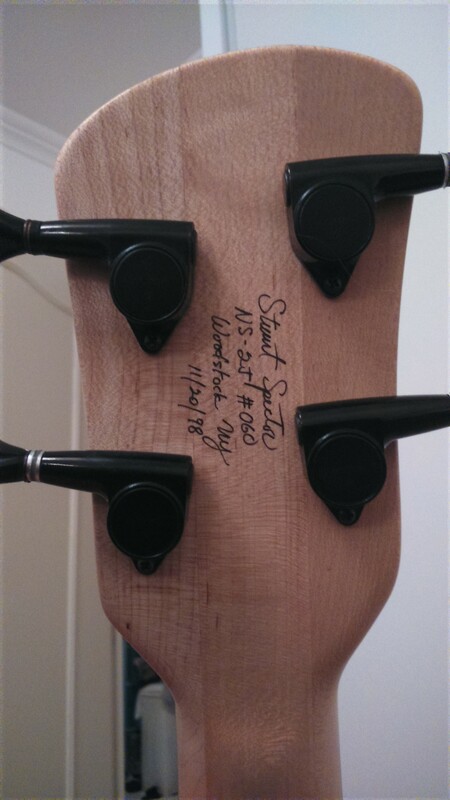 It sports the #60 and was made on november 11th, 1998 (handsigned on the back of the head by luthier/builder Stuart Spector, with number and date, even the address is on it!). In case you’d have an opportunity to get a US Spector… Give it a try!!!! And I’m sure you’ll buy it. Plus, there are plenty of Fenders everywhere, you can still buy one in the future, one or even ten years from now. Fact is – I’ll never sell my Spector. Never, ever!!!! That’s one less on the market… Mine is from a very limited series of NS-2J (with the J standing for “jazz”), with only 80 to 100 ever produced worldwide. And them being so rare comes from the fact that once you get one, you keep it!!! If the Spector NS-2J Limited Edition was an animal, it would be a lion: powerful, strong and warm! This one is 2,600£ – which is approximately 3,500 euros. - Another cliché: "Spector ain’t for funk"... -> FALSE!!! And so on : I haven’t gone through every website there is but I’ve heard such things… I couldn’t help it and put things back into place. 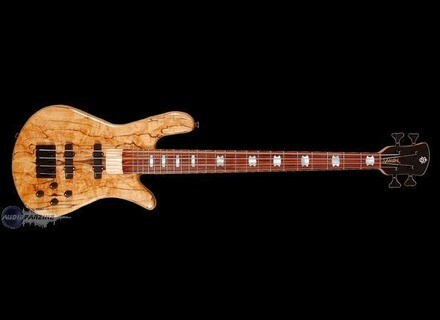 Don’t forget that this site’s blue book value seems oddly out of touch, which after all seems normal considering how difficult it is to find and estimate such a bass, with all US models being customized from the start – including the wood, neck/top, pickups, color, lacquer and various options (detailed at spectorbass.com), with so many series, models and so on. So all these basses are basically different from any other, hence unique! This blue book value is also only based on the last years on this very website, so it includes many European series (LX, Legend, Forte…) Spector basses, which quality differs largely from US models. A bit like Fender, which Mexican versions vs US Custom shop ones. 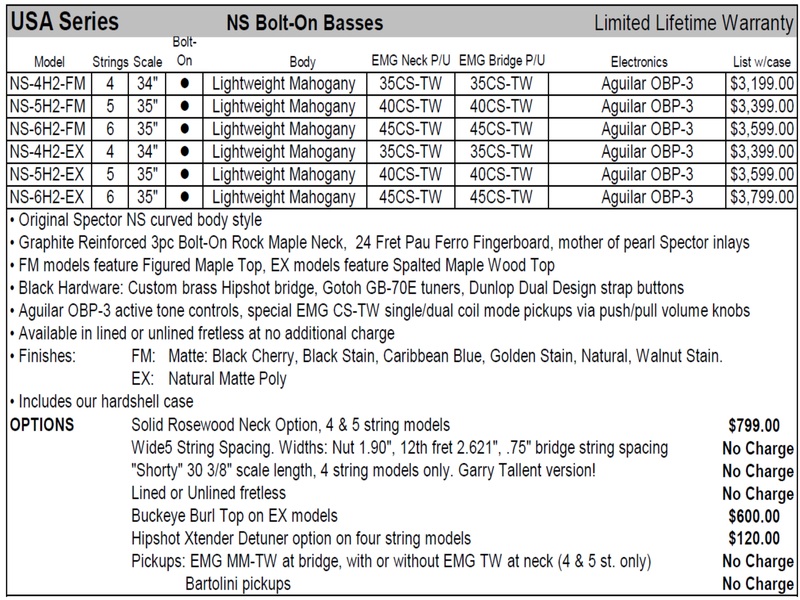 For the record, also note that NS2-Js (for EMG Jazz) are the same except for different pickups compared with the NS4(+H2 for humbuckers, e.g.). I don’t want to be a preacher, but I insist on being fait to this manufacturer and his work with such wonderful basses – plus it’s hard for me not to say anything when I feel like I’m being made a fool of. Hopefully, these details will help you not being duped on the real quality of what tou own!